Disclaimer: LEAR LCM-Turbo was sent me from LEAR in exchange for a review. The base price for the Turbo is 220$ for custom, excluding other expenses with design options. It also goes around 160$ for universal. LEAR Audio is not an advertiser. 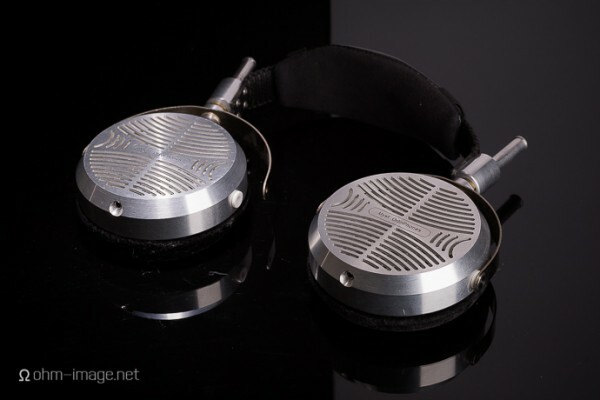 As I’m getting more into Custom IEMs at recent times, here I am with my 2nd Custom IEM review on Headfonia. I’ve finally stopped being lazy for making ear impressions and send them out to different brands now. Expect to see me rubbing my shoulders with CIEMs more, and with writing their reviews of course. This review was on the horizon a long time ago, around July last year when I first contacted LEAR Audio. Nathan reviewed their flagship LCM-BD4.2 almost 4 years ago (time flies), and the NatroSound NS-U1 2 years after that in 2016 so we had a good history with LEAR, even though it wasn’t very contentful in these 4 years. We will try to work together more often though, and I hope that this is the actual start of that. 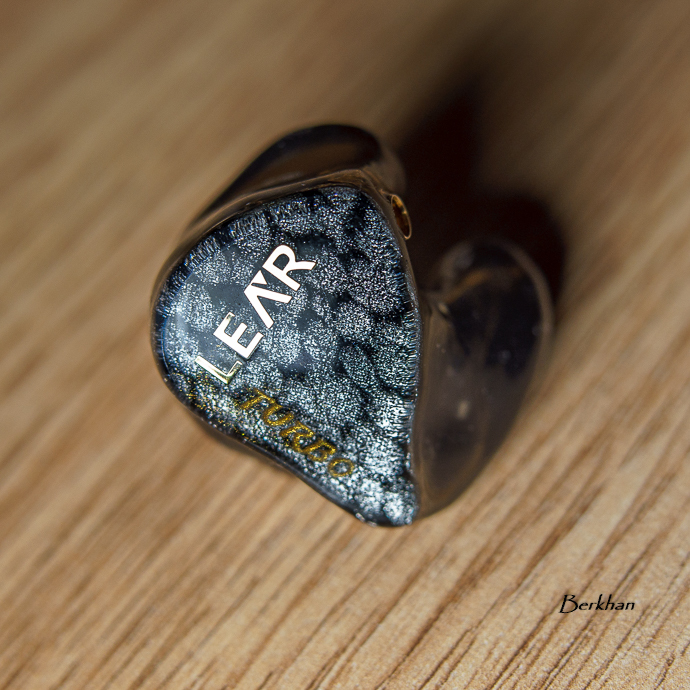 LEAR is a brand from Hong Kong that makes beautiful custom and universal in ears since 2008. This is quite a long time for a CIEM manufacturer in the market’s standards, especially compared to many newer brands that we’ve been tracking since their establishment. I heard about LEAR when one of my audiophile friends purchased the LCM-BD4.2 more than 3 years ago and wrote a review on it. The extraordinary driver configuration was certainly eye-catching. I was told that it is very spacious sounding with a very wide stage and high resolution with great bass response. LEAR indeed likes to use those dynamic drivers and that alone makes them different to many brands out there who only use BA drivers. Tatco Ma is the founder and CEO of Forever Source Digital, which is a very nice and well-known portable audio retailer in Hong Kong. LEAR brand operates with the full support of the shop. Tatco is very responsive and easy to communicate through all the process and I had no problems whatsoever. I sincerely thank him for his support and cooperation for this review. LEAR Audio is very responsive and as I said Tatco is very easy to work with. I get answers to all my emails quite fast. Being careful about the time zone difference helps of course. If he was busy somehow, he still didn’t forget to reply me 2-3 days later. There was no unanswered mails. I appreciate that. There was also a small problem about the stock cable connectors and he immediately sent a new cable to me. He let me choose my design over a lot of options available, and I received exactly what I intended. One more thing which is nice about LEAR is that you get a 1 year refit service. That’s only for small modifications though. Complete remaking of the shell is not included in that time period. You also get 1 year warranty for your CIEMs. LEAR LCM-Turbo arrived me in a full black box that looks really nice. When you open it you get a simplistic yet elegant presentation inside. There’s your round black carrying case in it, and the accessories section on the top, which designed like a cardboard drawer that stores the cleaning cloth and the tool. That’s about it basically, yet it’s perfectly nice and enough for a set of CIEMs. I liked the carrying case because of it’s full black and stealth look. Practicality-wise it’s very very light and most importantly deeper than most cases out there. So it’s very easy to store your CIEMs in there, even with thick aftermarket cables I suppose. It makes sense, and looks nice, so I’m happy with it. These are acrylic shells of course and they’re almost perfectly crafted. There’s a really thin and short line of glue mark between the face plate and the shell on the right piece. But you have to put a light on top and look really careful to the inside to spot it. Therefore it’s not an issue at all in my opinion. Other than that, the face plates are finished and closed perfectly and they’re very smooth with the shells in terms of transition. The artwork on the plates are cool and they look unique especially with certain amount of light with a nice angle. On the shell I spotted a bubble on the right nozzle part, but again it’s not noticeable in ordinary conditions. You need to inspect the earpiece carefully to see it. Since my unit is black colored, it makes it even harder to spot it anyway, so again it’s not a big deal for me. That aside, the shells are perfect top to bottom, and the air vents for the drivers look clean. Putting dynamic drivers of course require additional vents on the shells. That means an extra process compared to classic CIEMs with full BA drivers. So LEAR has done a very good job of craftsmanship overall. I can see those 2 different types of dynamic drivers inside, and the placement is very tidy and compact. The cable is MMCX so are the sockets on the shells. You can select 2 Pin, 2 Pin Recessed and MMCX sockets for your CIEMs. I didn’t select any type and received them as MMCX. No problem of cutting sound or anything, like we sometimes see with the earphones that use the MMCX type. I can move my head anywhere I would like and there’s no cut in the sound. The connectors sit tight in there and they give a sturdy impression overall so no issues there. Overall it’s a great job from them, apart from really small dents which can only be seen by inspecting very closely. LEAR makes impressive designs and provides really nice options to its customers in terms of looks. I decided to go for semi transparent black shells with “snake skin” face plates. Brand and model names are on the right piece and my name is on the left one. Tatco is very nice and talkative about the design process. I got to choose a favorite font from a database as well, and then they perfectly applied it to face plates. 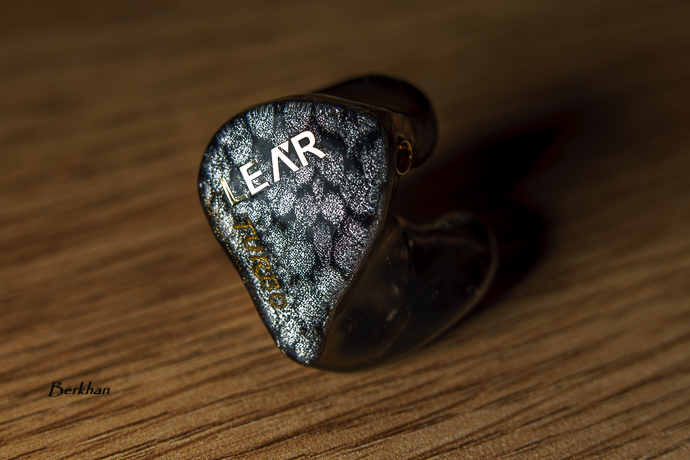 By the way, I think the gold LEAR logo on the right ear piece is just beautiful to look at. While saying this, I personally think LEAR should update their website for a better ordering experience. You get to select 4 or 5 options in the ordering page of the model you select, but in reality they can do much more than that. So you need to contact by email or WhatsApp to tell your special requests for the design, just like I did for this pair. I have no doubts that they could do what you want to have, but then again it’s not very clear what you can ask for the design in the website. 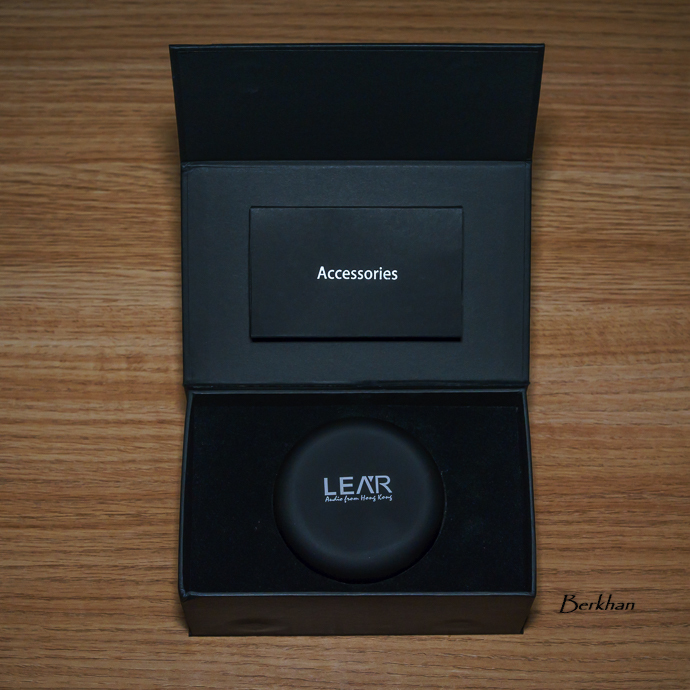 LEAR also has a very unique option for their customers, named as “semi-hard shell” which you can have for additional 64$ (approximately). You can find the details HERE. Basically it’s an elastic shell which stretches around when you apply force to it, but gets back into the position immediately. It’s a very interesting solution and I’m curious about how it can ease the insertion process for your ears, not to mention possible comfort benefits. Maybe with the next review with them I could try it out and reflect my experience. HIGH END & CANJAM EUROPE 2018 – Munich! Thanks for the great review! I noticed that you said the R6 was not an optimal match. Have you tried it with something like the IEMatch? Curious as I just got the R6 and these look promising. R6 is not a good match from the SE output, but it’s pretty good with 2.5mm BAL output. If you can find a 2.5mm silver cable, you can get a great result. 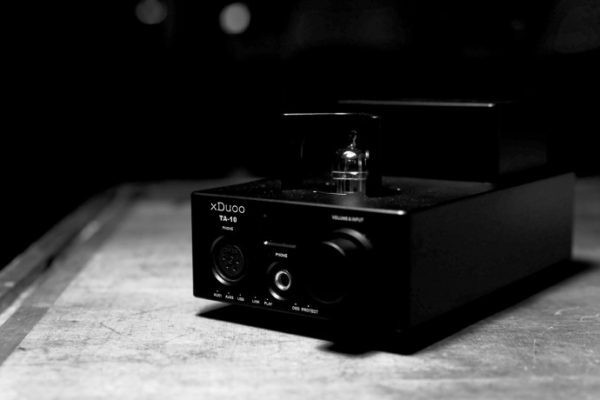 Can you try it with portable amps like the Vorzuge and Picollo? No I’m afraid, but an amp would get these to a very competitive performance level than it already is at. What are your thoughts on this iem in universal format? Would it also be considered a good choice for someone looking for this type of sound signature, or are there better options? I am coming from an iBasso IT01 (Which unfortunately broke). With the universal shell sound could be a little different. I recommend getting the custom. But yeah, if you like this type of dark and meaty sound then you can get the universal model. It’s costs lower then CIEM. 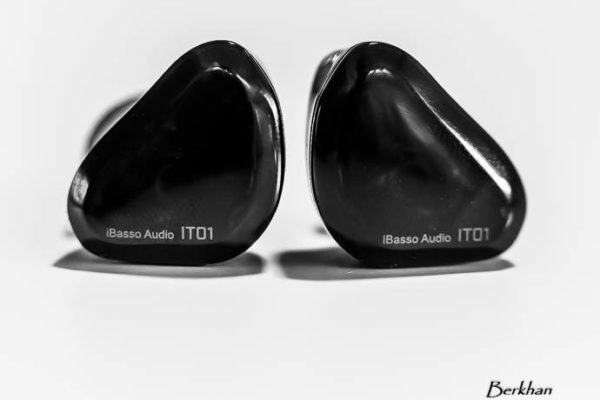 This in my opinion is a better IEM than the IT01. But they sound quite different. Turbo sound quite dark and heavy. I like warm signatures so I like it. where can you buy the Lear? 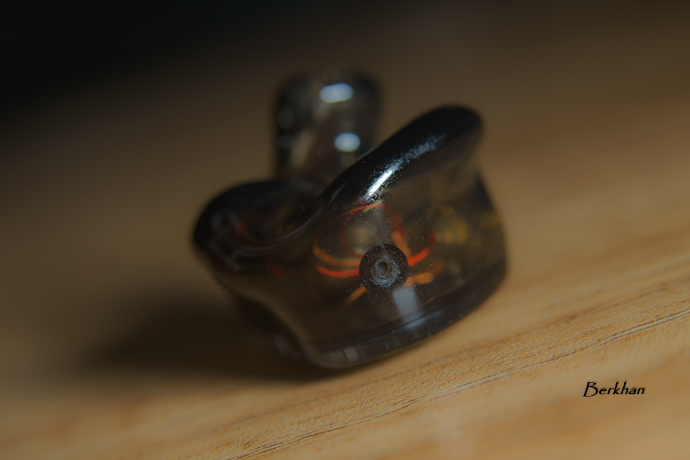 Have you compared these to any other Lear IEMs, like the Kaleido? I’d be really curious how the sound signatures compare. The Kaledio’s mid range is recessed and dark, making it quite v-shaped and I personally think the Turbo is the more coherent and consistent monitor.